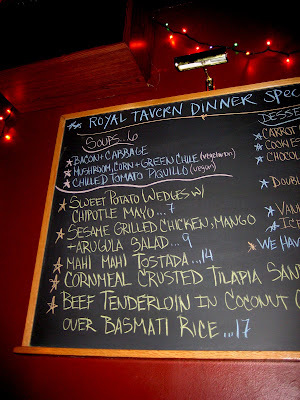 Before heading out to a show at the FU on thursday night, I met up with B for a quick bite at the Royal Tavern. I’d been wanting to go here for awhile, but just never had a chance to make it. On a thursday night, this place was totally packed. We were lucky to get a high two-top. The place is a long and skinny. There are christmas lights that hang all year long. And it’s unbelievably loud. It’s as if because it’s loud, everyone has to keep talking louder in order to hear themselves. But if we all just talked normally, then it wouldn’t be that bad. But unfortunately, everyone is just screaming. It was still fine, but damn, it would have been so much better if it wasn’t so crazy loud. 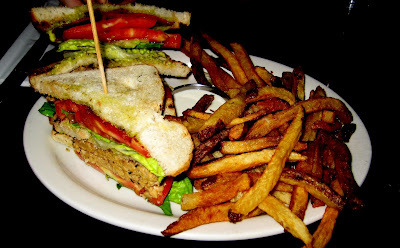 B got the tempeh club, one of the vegan options. This was a thick and hard to maneuver sandwich. Came with fries and a pickle. 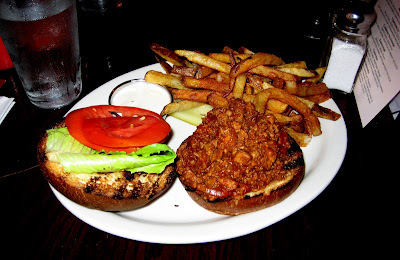 Somehow, I ended up getting a vegan sloppy joe. How we both ended up getting vegan dishes is beyond me, as we’re both avid meat eaters. This was good, but also pretty difficult to eat. The fake meat kept falling out everywhere. I had a fake sloppy joe stain on my skirt all night. Fries were good though. The pickle was fabulous. Service was ok. Our drinks were always filled, but it was a bit hard to get the check.